Since I am not a chef (or even decent cook, for that matter) my contribution to the holiday festivities is that I always bring the cheese board. While this may seem like a cop-out of a task, it’s not easy finding complimentary cheeses that will please all palates. Milk types, pate color and flavor intensity all come into play when making selections. This Independence Day, I went with a fully represented board of the four top milk choices: cow, sheep, goat, and even buffalo. While all the selections were hits, the goat’s milk La Clochette was the clear winner of the bunch. 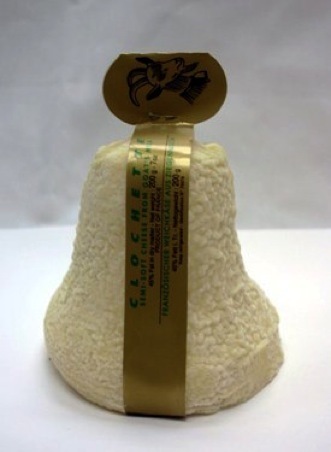 La Clochette means “little bell” in French, yet there is nothing little about what lurks inside this bell. This seasonal goat’s milk cheese is produced in the region of Poitou-Charentes from March to the end of August with limited quantities. While considered a fresh-ripened cheese, it is actually aged in caves for 30 days to produce a sweet, grassy tang not usually found in a chevre. Young bells are white with a bumpy texture and have a crisp and light zip on the tip of the tongue. As it ages, the exterior can show some slight mold, but have no fear…it is edible and yummy! While this fromage is perfectly respectable when served slightly cool, it is best when allowed to reach room temperature for full flavor. Personally, I like it just past room when the interior white pate becomes gooey and runny while the flavor just bursts with assertive earthy goodness. Yet this semi-soft cheese is considered a chevre despite its brie-like pate and a fuller flavor that’s not typically found in a fresh goat cheese. Serve with a light white or mild red and stay away from berry beverages as the acid battles with the goaty taste. I love regular chevre and this sounds altogether different, but still pretty darn tasty. Cute form!